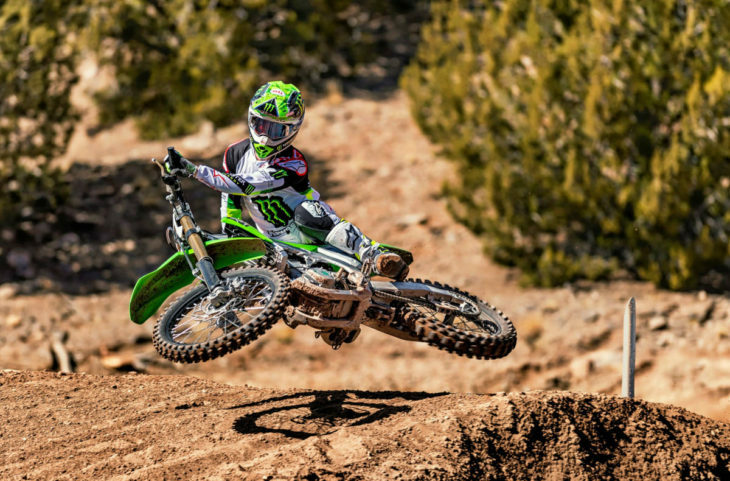 We don’t typically pay a whole lot of attention to motocross bikes here at MD, but the 2019 Kawasaki KX450 caught our eye when we saw the press release this morning. This is, essentially, an entirely new motorcycle … redesigned from the ground up. 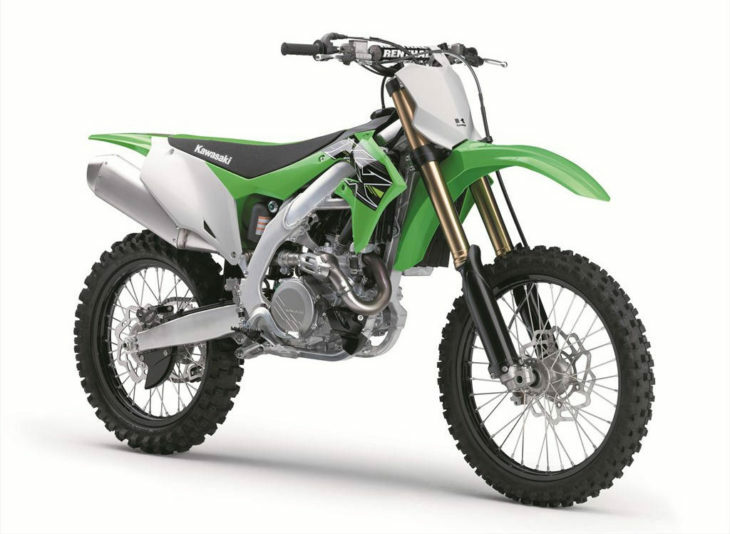 It is also the first motocross bike from Kawasaki to feature electric start. Despite the new starter motor and battery, the new KX450 still comes in at a svelte 232.4 pounds dry. 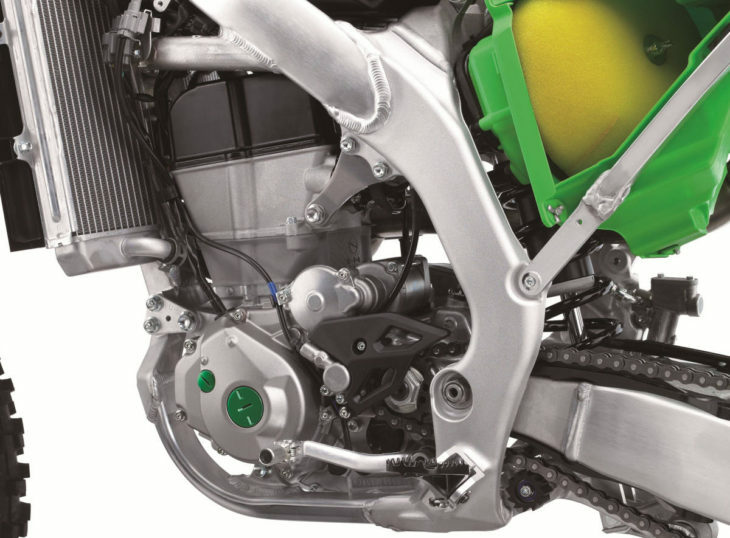 In all, Kawasaki presents a new engine, new frame (slimmer), new suspension, new hydraulic clutch, and several other new features described in the detailed press release that follows. Kawasaki says the bike is available now at U.S. dealers at an MSRP of $9,299. Looks to be a nice bike with some good updates. However, the 450’s have too much power for what I need. 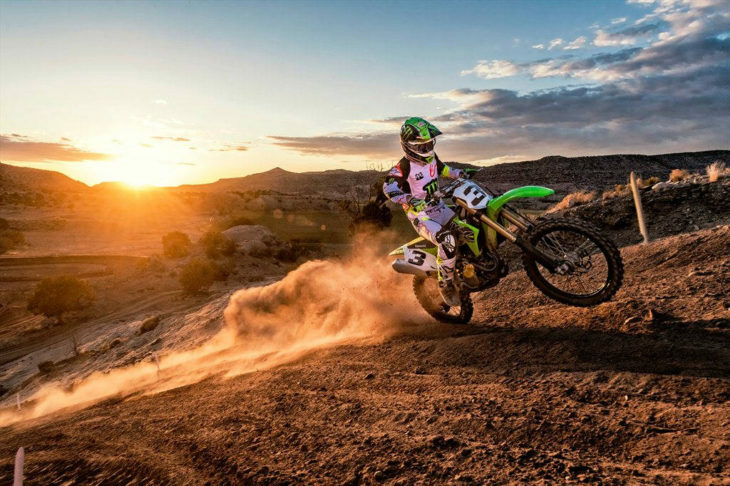 The kx250F has good power for me but is too loud. In my younger days I did not want e-start to save weight. Now I only want e-start. 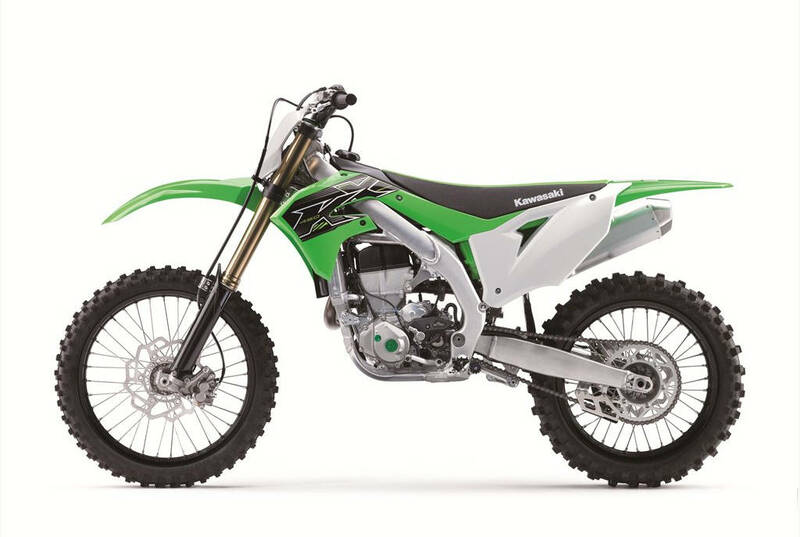 Will definitely be interested to see if Kawasaki morphs this bike into off-road and dual sport versions a la Honda’s recent move. Would add even more color to the market. Looks like I will be sticking with my enhanced 2002 CR250R (which is still in great shape). I have been a Kawasaki rider for years, and reading these articles KTM looks like they are making big strides in the market. I will look at the KTM more closer after reading this article. Thank you motorcycle daily. Motocross Action test of this bike. These manufacturers are sniffing too much brake fluid if they think everyone who rides needs to pony up to a $10k bike. A 250 2 stroke is plenty fast for weekend warriors and much easier on the wallet. Nearly 20 years after they told us ‘the writing is on the wall, two strokes will be outlawed,’ and 2 strokes haven’t gone anywhere, even in California. If their goal was to make motocross look like Superbike racing, with half empty grids, then I guess four strokes have been an overwhelming success. Two strokes will disappear soon in CA. There are proposed changes to red stickered bikes that will effectively get rid of two strokes. Personally I think that’s a good thing, since those things pollute the air horribly. People have been saying that since the early 2000’s and still nothing has happened. Do you have a web link to an article on this issue? Also, KTM has injected two strokes that effectively run at 100:1 ratio, so 2 strokes can be made to run a lot cleaner than 32:1 with a carb. At that point the bike will surely cost more, but at least you don’t have to drop $1000 dollars into the thing every time a valve wears out like with thumpers. Same thing happened in the outboard/Personal watercraft industries, but two strokes are still alive and well. The technology is out there to make smokers compliant. KTM/ Husky are already prepared with their fuel/oil injection system, because they are actually in touch with the grass roots of the sport. They don’t think everyone needs to. Nor does Ford think everyone needs to spend $60K for a 1/2 ton pickup truck with a diesel. Prices are based on supply, demand, what the market will bear, and what the competition charges for competing products.Some consumers will buy those vehicles and some won’t. Ford isn’t the best company for comparison purposes(since they will stop offering many models in the US, soon), so I’ll use Toyota as an example. Not everyone needs a V8 Tundra, so the Tacoma is available so that people who want a truck can have something that fits their needs more perfectly. 125 and 250 two strokes are like the Tacoma, and Thumpers are like a V8 Tundra. Toyota would sell a lot less vehicles overall if they only sold big V8 trucks. No, a lot of people will be well served by the 2016-2018 generation KX450Fs that will we traded in for these 9200-dollar bikes. And a lot of riders will buy the older bikes that are traded in by those folks. That is also a big part of how the consumer affords a new bike: a thriving second-hand market. These are not disposable trash after a year. These 450s are a lot easier to ride than the 250 two-strokes and offer great value and longevity. That is why they sell. Now just take that motor and put it in a retro standard. Kawasaki Z450RS. While I’m sure these current motocross bikes are all better than decades before, I’m glad I raced back when great race bikes retailed for around $1595 for a 250. Along with the cost of a new bike now a days, and the much more expensive gear for riding, not to mention I’m sure the sign-up costs and whatever else, I couldn’t afford to race anymore. Everyone can’t get sponsors either, you have to be so good, and then it’s difficult in places to get meaningful sponsorship. Ummmm…When did dirt bikes get to be $10K? Day-um. All it would take is a headlight, turn signals, horn, license plate holder, and titanium fuel tank, and we could have a whole new argument about how much a truly dirt-oriented dual sport should cost. All kidding aside, I have to wonder if the electric start doesn’t give away future intentions, depending on how well Honda’s new 450 DS does. H, & S’s large thumpers are pretty long in the tooth, I’d be surprised if the DMV wouldn’t give you antique plates for Honda’s 650L right off the showroom floor – one of these days, the EPA may say “time’s up” for machines with air-cooled, carbureted motors (with pistons not made from carbon fiber, hat tip to Tom R.). Finally, do those squiggles actually count as brake “discs”? I’ve got to start paying better attention. I don’t think so. Electric starting is just something that you now need to have in a competitive (in the market place) motocross bikes. Even the 250s have it. I doesn’t mean that a dual sport is not coming, though. Must be lighter. Just make everything on the bike out of carbon fiber. Frame, seat, pistons, wheels, tires, chain, valve stems, bearings, wheel balancing weights, everything! And find a way to make carbon fiber combustible, and use it for fuel! It would weight what, 67 pound maybe? That would make for some serious “Mine is the lightest bike” bragging rights. Congratulations Kawasaki, you managed to engineer a rear axle nut without a cotter pin! Well done, just a couple of decades after the competition. Just kidding. The new bike looks great and it nice to see that Kawasaki kept the weight advantage it had among the Japanese bikes. The difference was not negligible in 2018. The Honda weight is curb weight, that is all fluids, etc included. The Kawasaki weight is without fuel. Add a couple gallons of fuel, ~13 pounds, and the weight difference is negligible. Same with the Yamaha, they report curb weight. I counted the word “New” at least 29 times for this “Completely Redesigned” motorcycle. Did they re-invent the wheel while they were at it? MX bikes seemed to change ever 2 years. Inbetween years, its minor improvements, adding to the stock bike, known improvements. Many times, “New” may not be an improvement, but indeed a change of construction, meant to improve things. The finger follower in the head, is a big deal, if its made right. The frame changes, are difficult to know first off. Anyone can make a strong frame. Years past, many bikes would break the mount plates, and engine cases. All in the attempt to allow the bike to flex, creating a better handling machine. Where and how it flexes, isnt easy to translate into what needs to be built how. The Japanese are good at constantly fine tuning, experimenting. New, in that something is changed, if not better immediately, often points out what was lost in the change, something not seen so obviously before. New is good. The biggest complaint I have with the changes MX bikes get year after year after year, is what “they” consider an improvement. Every year, they like to change the geometry a bit stating that it’s better than last year. For Who? The 120# supercross rider on their factory team that season? The 120# MXGP rider they have that season? The next year they change it based on another 120# supercross rider’s desires, and again the next year for a new rider. For everyone else of normal stature that buys their own bike, only 1 out of 10 of those years actually agrees with their riding style. If you buy any of those other bikes, you’re spending more money on suspension upgrades and different offset trees and clamps to get it to handle well. Trust me, they are not actually improving the bike year after year after year. At least regarding the chassis. They did a good job of keeping the weight down when adding electric start. Honda and Yamaha could take note, the crf450 weighs 248 pounds and the yz450 weighs 245. Suzuki RMZ450 is 247 pounds without electric start, yikes! KTM 450SXF is the featherweight of the class at 222 pounds with electric start. The weight listed in the article is WITHOUT fuel and is stated as such. All the other bikes you listed and their weights are with fuel and fluids ready to ride per their websites. If you go to Kawasaki’s website it shows that this bike WITH fuel weighs 242.2 lbs. Not that much different than the other bikes. I couldn’t find the specs for the KTM but it is likely without fuel as well. The weight listed in the article is WITHOUT fuel and is stated as such. All the other bikes you listed and their weights are with fuel and fluids ready to ride. If you go to Kawasaki’s website it shows that this bike WITH fuel weighs 242.2 lbs. Not that much different than the other bikes. I couldn’t find the specs for the KTM but is likely without fuel as well. Sorry for the double post. I posted it once and it disappeared so I reposted it. And then the first one showed back up again later. A mystery to me. The KTM is without fuel, so add another 12 pounds or so to that, but still the lightest. KTM also has the biggest tank.